Between the world wars, halftrack vehicles became popular in world's armies, mostly employed as artillery tractors. They offered a good off-road mobility for a reasonable price. In Poland, French halftracks Citroën-Kegresse were initially used. In the 1930s, the Polish designed several own halftracks. One of them entered production as the wz. 34 (wzór 34) halftrack car - 1934 Pattern (not to confuse with wz. 34 armoured car). Its best known variant was the C4P artillery tractor. The halftrack car wz. 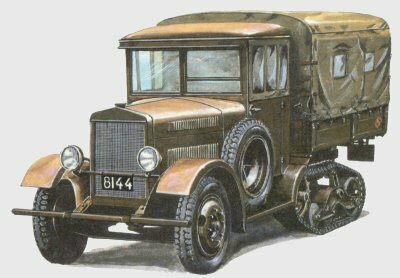 34 was a Polish derivate of a 2.5t truck Polski FIAT-621, which was produced by Italian licence since 1932. The halftrack variant was designed in 1934 by the Armoured Forces Technical Research Bureau (BBT BP) in Warsaw. The design utilised many truck components, including engine. Some of them were strengthened or modified (a frame). A gearbox was modified to better suit off-road ride. The main change was a replacement of a rear axle with a track gear. The track mechanism was inspired by the French halftracks Citroën-Kegresse P14/ 17/ 19 and Vickers E tank suspension. A prototype series was built in early 1935, a series production started in 1936 in PZInż (Państwowe Zakłady Inżynieryjne - State Engineering Works) in Warsaw. Until 1939, about 400 halftrack cars were completed in all versions. At least 80 of them were artillery tractors C4P. In some publications all wz. 34 halftracks are mistakenly called "C4P", but this designation is correct for artillery tractors only. The wz.34 halftrack was quite succesfull design. Its drawbacks were quite big fuel consumption and the engine being too weak. A late production tractor C4P, with a short platform, towing 120mm gun wz.1878/09/31 with small rubber tyres, in the late 1930s. Due to lack of any monographic books on this type, this chapter is partly based on analysis of poor quality photos, and some of conclusions might appear incorrect. The artillery tractor C4P was the best known version of wz.34 halftrack car. At least 80 C4P tractors were completed (including 15 rebuilt from wz.34 cars). There were at least 4 variants of this tractor: 3 for field artillery and 1 for anti-aircaft artillery. 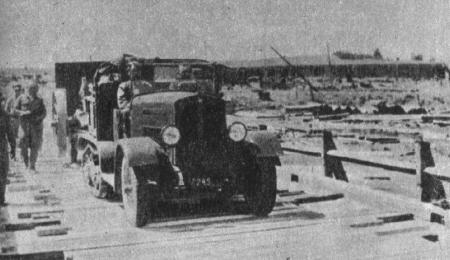 Right: an early tractor C4P, towing 105mm gun wz.13 on a special trailer. More photos at Wojsko i Technika page. 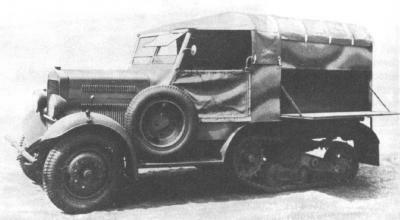 The early C4P field artillery tractor had an open cab, upon which a canvas top could be raised. From the photos it appears, that all were produced in a variant with a short platform, for towing heavy 120mm and 105mm guns. Behind the front two seats, there was a transversal bench for four crewman, sitting rearwards. In this variant, a gun was hauled on a special hook like a semi-trailer. Late-production C4P tractor with 75mm wz.1897 (Schneider) field gun and a caisson, in Stryj barracks. The tractor has a small skull painted on a door, indicating the 1st battery, called "The death's battery", taking traditions from the heavy combats of the 4th battery of the 1st Mountain Arty Rgt in Polish-Soviet war. That regiment was converted into the 1st Motorized Artillery Regiment (1.pamot) in 1931. 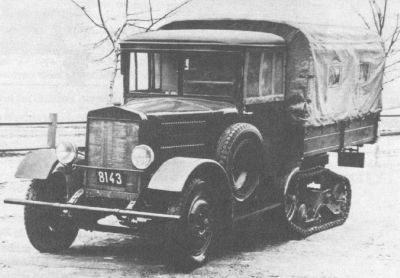 Later series C4P tractors had closed wooden and steel cab, similar to the PF-621 truck. A spare tyre was carried on the left side. It also differed in some other details from the early variant (eg. in wheel hubs and a new shape of a rocker-arm in track mechanism). The late series tractors appeared in two variants: with a short platform, for the heavy artillery, and with a long platform, for the light artillery. Most probably all variants of tractors had the same short chassis frame. The tractors with a short platform had a transversal bench and a semi-trailer coupling, like early tractors. A canvas could be set up over the platform. 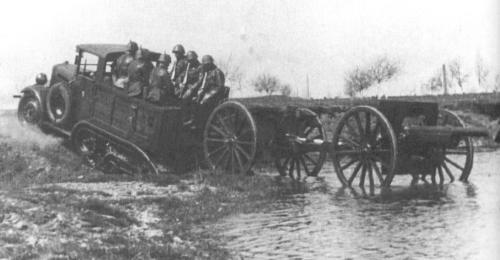 The variant for the light artillery had a longer platform behind the driver's cab, with two benches on the sides - each for 3 crewmen. The 7th crewman could sit between the benches, behind the cab, facing rearwards. Underneath high benches, especially in the rear, there were some stowage boxes of unexplained purpose. Such tractors were used for towing 75mm and 100mm artillery pieces with limbers. The version of the C4P for the AA artillery had an open cab and crew compartment and longer platform. Just behind the front seats there were two benches on the sides, each for two crewmen. The seventh crewman sat between the benches. In the rear there was a transport compartment with a canvas top, the canvas could also be raised upon the crew compartment. Two spare wheels were carried on both hood sides. These tractors were towing 75mm wz.36 St. AA-guns and ammunition trailers. 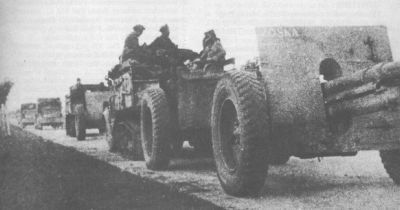 The C4P tractor for the AA-artillery towing an ammunition trailer. Behind it - one towing 75 mm AA-gun. On the tractor, there were carried 8 ammunition boxes with 4 rounds each. Trailers' tractors carried also 3 boxes with fuses (32 in each), guns' tractors - 2 boxes with fuses and 1 equipment box. The basic variant of the wz. 34 halftrack was a halftrack truck with a closed cab, the longest chassis frame and a long platform. The cab was similar to the PF-621 truck, but simplified. A canvas top could be raised upon the platform. 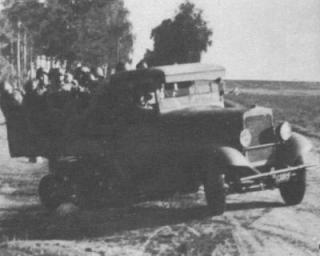 The halftrack on the photo and drawing has an early shape of a suspension rocker-arm. Quite common variant was wz. 34 workshop car. It had an open, steel body, with canvas top and doors. Sides of a working compartment could be lowered. The car was based on a medium length chassis frame. (a color sideview). Similar were the wz. 34 and C4P vehicles for towing AA-searchlights and the equipment trailers in the AA-artillery. An interesting version was an off-road ambulance. It had closed steel body, a driving compartment was separated from the rest. Eight sitting injuries could be carried on soft benches, or four lying on stretchers in two levels. Probably about 50 ambulances were built. a fire engine with a ladder, used in Lwów (Lviv) Fire Brigade - probably one vehicle. wz. 34 "lot" (or: C4P "lot") - a variant for the airforce (shortened, for aircraft hauling). The 16th motorized artillery battalion had at least 2 of these, utilized as artillery tractors. wz. 34 car with a baloon winch - probably only one vehicle. wz. 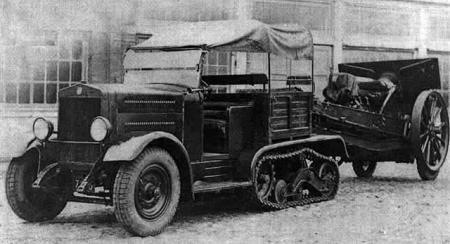 34 halftrack truck with a rails-riding device. It was installed on a standard vehicle, and enabled riding on the rails. The car was driven normally by its tracks. See more on the draisines page. The early C4P tractor towing 105mm gun wz. 13, in the mid-thirties. From late 1936, C4P tractors were issued to the 1st Motorized Artillery Regiment (pułk artylerii motorowej - 1.pamot), replacing Citroën-Kegresse P14 and P17 halftrack tractors. Not all Citroëns were replaced until the war, though. The 1.pamot was a peacetime unit located in Stryj town (now in Ukraine). According to an organization of 1938, it consisted of a light battalion (2 batteries of the 75mm guns and a battery of the 100mm howitzers), and a heavy battalion (2 bateries of the 120mm guns). Until 1935, the 105mm wz.23 guns and 155mm wz.17 howitzers were also used in the motorized artillery. - and the 2. dam for the WBP-M brigade, equipped with 8 x 75mm guns. 18 tractors C4P were used for towing 75mm wz.97 (Schneider) field guns and 100mm wz.14/19P (Skoda) howitzers in the 16. dam. The guns were towed along with their caissons, other tractors were also hauling ammunition trailers. All the guns and equipment were fitted with the rubber tyres. The field cars and telephone line cars were PF-508 III Łazik, PF-518 Łazik and PF-508/518 cars. Probably all tractors of the 2. dam were older Citroën-Kegresse. 100mm wz.14/19P howitzers with their C4P tractors (long platform) of the 1st Battery ("The death's battery") of the 16th Mot. Arty Bttn (16.dam) of the 10th Motorized Cavalry Brigade (10.BK), moving after a fight for Zboiska village (near Lviv) on 17 October 1939. The first gun has a female name 'Zośka' (Sophia - informal), painted on a shield. 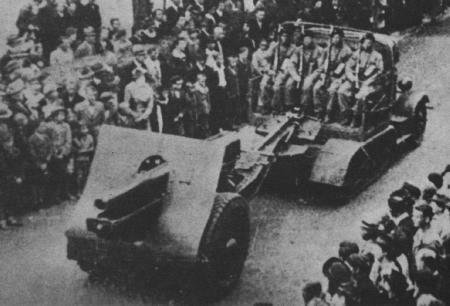 After over 2 weeks of constant fighting, in which the motorized artillery had a great share, on 19 September the whole Brigade was ordered to cross the Hungarian border. It gave away all the equipment there, with all halftracks and guns of the 16.dam as well, and was interned. The third mobilized motorized artillery unit was the 6. dam - 6th Mot. Arty Bttn for the Army "Łódź" (Lodz). It was a heavy artillery unit, with three 4-gun batteries of old 120mm guns wz.1878/09/31 (Schneider). The Battalion was fighting from September 13 in Zamosc area. As it shows on photos, the 6th Battalion had C4P tractors with short platform. Probably a late-series C4P with a closed cab and a short platform, hauling 120mm gun wz.78/09/31 (with Michelin DS tyres). The picture is incorrectly described as 155mm howitzer in the source . Unfortunately, a poor photo quality does not allow to tell for sure, if this is not C-K P14. From 1937, all the guns of the motorized artillery (75mm, 100mm and 120mm) were fitted with rubber tyres Michelin DS, filled with a porous pulp. The 120mm guns were also used with smaller wheels with fenders. Before 1937, the guns in the motorized artillery were used with original steel and woden wheels, which limited maximum towing speed to about 7 km/h. There were also used rubber-wheeled "roller-skates", put under the guns' wheels. The "roller-skates" were not satisfactory, however, and failed in off-road riding. Initially, there were also 105mm guns wz.13 (Schneider) used in the motorized artillery, carried on a special trailer with rubber tyres, and 155mm wz.17 howitzers with "roller-skates". They were withdrawn about 1935. Another usage of the C4P tractors was in the motorized AA artillery. Before the war they were used in the 1st AA Artillery Regiment - it was a big peacetime unit, containing a mix of different guns and vehicles. 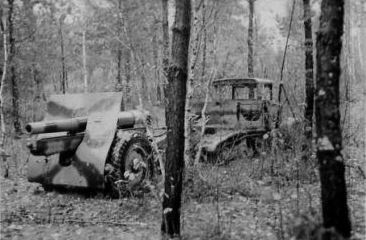 At least 18 tractors C4P were towing 75mm wz.36 St. (or: wz.38, Star) AA-guns (the only modern AA guns, of Polish construction), and the ammunition and equipment trailers. During the mobilization, all the 75mm wz.36 St. guns with their C4P tractors went into the 11th AA Artillery Battalion (11. daplot - dywizjon artylerii przeciwlotniczej). It had three 4-gun batteries, and was assigned to Warsaw Defence. Since 8 October 1939 the unit defended Lublin, later Łuck (Lutsk) and Stanisławów, near Romanian border. Finally, on 19 October the 11.daplot was ordered to cross the Hungarian border. It gave away its equipment and was interned there. The halftracks were also towing AA-searchlights and Goertz sound detectors, and carrying equipment in the Electrotechnical Battalion (in Nowy Dwór Mazowiecki, near Warsaw). In 1939 the Battalion formed, among others, three AA-searchlight companies for Warsaw Defence HQ. The 11th and 17th companies had mainly tractors Citroëns-Kegresse, but the 14th company had 28 tractors C4P and 4 halftracks wz. 34. 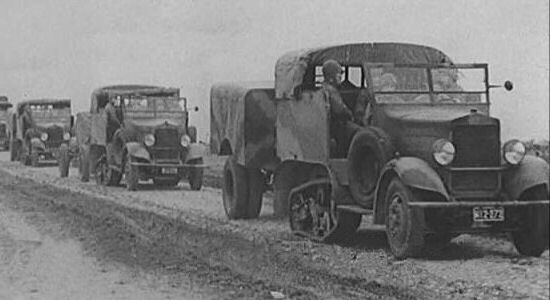 The halftrack cars wz.34 were used as all-terrain trucks, recovery and repair vehicles, field workshops, armaments workshops, trailer haulers etc. in different units, such as engineers and railway engineers. Two halftracks wz.34 should be in each Vickers or 7TP tank company as repair vehicles (in the 2nd Light Tank Battalion in 1939 there were even 12 halftracks wz.34, in the 21st light tank company there were 3). Two halftracks wz.34 were assigned to each armoured train as a repair patrol (they could have the rails-riding device fitted or be carried on support train's flat-cars). The halftracks C4P and wz. 34 were also used in the airforce ground service, for aircraft hauling. Apart from that, the wz.34 halftracks were used as troop carriers in the 10th Mot. Cavalry Bde (10.BK) from summer 1937. Each of both regiments should have 12 cars. They were used during Czech Zaolzie re-occupation in late 1938. Probably they were not used in 1939 - there is no information about it (there were not any among the vehicles given to the Hungarians after the border crossing, anyway - possibly they were replaced in summer of 1939 by 6x4 Praga RV trucks). The photo shows such vehicle, probably of a rifle squad of the recce squadron of the 10.psk (10th Mounted Rifle Rgt) at Zaolzie. At least 50 ambulances wz.34 were used by the PCK - Polish Red Cross. Most of Polish military ambulances did not belong to the Army, but to the Polish Red Cross, what allowed to save the Army budget. In 1939 the PCK with its cars was mobilized, creating 17 ambulance columns, consisting among others of wz.34 ambulances. Some of wz.34 halftracks or C4P tractors supposedly survived the war and were seen in private hands shortly after the war, but, sadly, none survived until now. The body of the wz.34 halftrack car was a mixed wooden-steel construction, seated upon a rectangular frame. The front axle was sprung on semi-elliptic leaf springs with shock absorbers. The rear suspension consisted of an axle suspended on semi-elliptic leaf springs, with a rocker-arm on it (earlier and later vehicles were differing in the rocker-arm shape). The two-wheel bogey and the idler were suspended on a rocker-arm. The idler wheel was also the last roadwheel. The drive sprocket was in the front. One return wheel was fixed to the rocker-arm. The tracks were pinless, rubber and steel, quite modern design. The track width was 0.3 m (11.8 in). Engine: Fiat-122B (PZInż. 367); 4-stroke, 6-cyl. inline, 2952 ccm, 46 HP per 2600 rpm, water-cooled. Gearbox: 4 forward gears, 1 reverse gear, with an off-road reducer. A more powerful 63 HP engine variant with the same capacity was worked in 1936, but the production started just in 1939. It isn't known, if any vehicles were fitted with that better engine, apart from 5 tractors fitted with prototype-series engines. The camouflage was a standard pattern of irregular patches in three colours: greyish-sand and dark brown (sepia) over brown-green, or brown-green only. Ambulances were painted in brown-green, with big red cross signs over white circles. See a summary page of color drawings. Load capacity 1.5 - 1.7 ton (and a 0.5 - 1t. trailer). As for the length - different versions. The shortest were short tractors, the longest wz.34 platform trucks. - WZ02 - C4P late with a long platform (kit named: "Polish halftrack"). Resin model, one of the first FSF kits, looks very crudely. See also great photos of an early C4P at Wojsko i Technika page. 1. A. Jońca, R. Szubański, J. Tarczyński, "Wrzesień 1939 - Pojazdy Wojska Polskiego - Barwa i broń"; WKŁ; Warsaw 1990. 2. Jan Tarczyński, K. Barbarski, A. Jońca, "Pojazdy w Wojsku Polskim - Polish Army Vehicles - 1918-1939"; Ajaks; Pruszków 1995. 3. Jan Tarczyński, "Ciagnik C4P" in: "Mlody Technik" nr 10/84. You can mail me with any questions or comments. All the photos and pictures remain the property of their owners. They are published in non-commercial educational and research purpose.